Whitewater rafting, zipline canopy tours, calm water float trips – we’ve got it all! Raft & Zipline with us & experience two of Asheville’s natural wonders; the French Broad River & the majestic Blue Ridge Mountains. 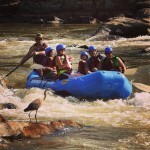 Best of all, with French Broad Adventures you don’t have to choose between ziplining & rafting. 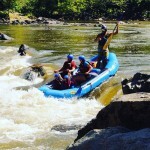 We are the only raft / zip combo close enough to Asheville that you can have fun with us and make it back to town in time for dinner. Take advantage of our vacation packages & save on all the thrills, chills, & occasional spills into the water! 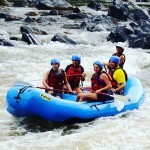 French Broad Rafting provides everything you need to enjoy a wonderful time on the free flowing French Broad River – just show up & we take care of the rest! 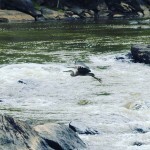 From our safe, state-of-the-art gear & the most experienced, knowledgeable guides on the river, to our friendly staff & comfortable new outpost, French Broad Rafting is the perfect host for the rafting novice as well as the thrill-seeking experienced rafter. Choose the half-day trip with lively Class II-III rapids, the full-day trip with Class I-IV whitewater, or the leisurely float trip beginning in historic Hot Springs. HAVE YOU EVER WONDERED WHAT IT FEELS LIKE TO FLY? Zipline with us & experience the beauty of the Appalachian Mountains while you soar from tree to tree in a scenic mountain setting. Our zipline adventure course is tree-based with 10 lines ranging in length from 75-1,000 feet long – totaling over one mile of cable! The professional French Broad Ziplines staff will make sure your trip is safe, fun & exciting. The views are stunning, the adventure is astounding & your memories will be unforgettable. Want to really see the mountains? 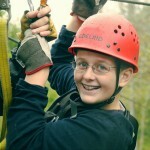 Zipline tours are one of the best activities for exploring the beautiful mountains of Western North Carolina. 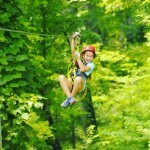 Zipline with kids or friends – the best ziplines in NC are waiting for you!